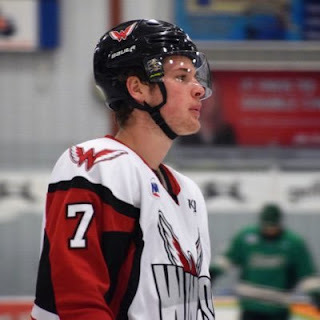 Back in late July, Quinnipiac picked up a verbal commitment from an Illinois born defenseman in Logan Britt, who played his midget hockey with Team Illinois before playing the past two seasons with the Aberdeen Wings in the NAHL. This season, Britt has moved to the top junior league in North America the USHL with the Lincoln Stars. He is the Stars third leading scorer this season with 11 points (3 goals, 8 assists) in 18 games played. Britt will be part of the 2019-2020 freshman class. Thanks to Logan for taking the time to do this Q&A. BobcatsHockeyBlog: First off you officially signed your National Letter of Intent to play at Quinnipiac. How does it feel to be officially committed now to the university for the 2019-2020 season? Logan Britt: It’s an awesome feeling knowing that it’s official. I couldn’t have done it without my family and all the support they have provided me throughout my whole hockey career so far. I’m very excited to get started. BobcatsHockeyBlog: Tell us about your overall recruiting experience with Quinnipiac? When did they first get in touch with you? Did you take a campus visit and what were your thoughts about it? BobcatsHockeyBlog: Did any other NCAA schools show interest in you and if so what other schools. What separated Quinnipiac from those others schools? Logan Britt: Some of the other schools that had shown interest were RPI and the University of New Hampshire. A couple things that separated Quinnipiac from the rest was the coaching staff, the facilities, and it’s a beautiful place to go to school. BobcatsHockeyBlog: Prior to playing in the USHL this season you spent the last two seasons with Aberdeen in the NAHL. What was that experience like for you? Logan Britt: My time in Aberdeen was awesome. Coach Langer and Coach Bohn were a big part of my development into junior hockey and they really helped me a lot in my journey. BobcatsHockeyBlog: You moved to the USHL this season which is considered the best junior hockey league in North America for developing college bound talent. How has your experience been so far with the Lincoln Stars and what have they done for your development? Logan Britt: My time in Lincoln so far has been really great. The team is a good group of guys and it really makes coming to the rink every morning enjoyable and gets everyone excited to work hard. BobcatsHockeyBlog: Some players don't play at a higher level in junior hockey. What were some of the reasons you decided to move on from the NAHL and play this season in the USHL? Logan Britt: With making my decision I wanted to get ready for college hockey. I thought that the USHL would help my development in the best way. BobcatsHockeyBlog: Tell us about your overall game. What are some of your strengths as a player on the blue line? Are you more of a defensive defenseman or someone that likes to join the rush and play more of an offensive style? Logan Britt: Some of my strengths are my passing, hockey IQ, and vision on the ice. I would call myself more of a puck moving defenseman that defends well but also likes to jump up and join the offensive side of the play. BobcatsHockeyBlog: With this being your last season of juniors prior to coming to Quinnipiac what are some of the areas of your game that you want to improve upon prior to making the jump to college hockey? Logan Britt: Obviously I want to get faster on the ice and also get stronger off the ice. Those are the two big ones knowing that I’ll be playing against older kids. BobcatsHockeyBlog: Have you been able to watch any Quinnipiac games for afar this season? What are your thoughts on how they have played so far? Logan Britt: I have not been able to watch any games this season because we play games on Friday and Saturday as well. I know that they have had a hot start to the season, so it’s awesome to see. BobcatsHockeyBlog: Is there any player out there in the game today that you try to model your game after? Logan Britt: Growing up I watched a lot of Chicago Blackhawks games so one player I used to watch a lot and still do is Duncan Keith. BobcatsHockeyBlog: To this point in your life who has been your biggest influence to get you to this point where you will play NCAA Division I hockey in a year? Logan Britt: My family for sure. They have helped me so much to get to where I am today. My parents have supported and sacrificed so much through my journey. I’ll forever appreciate what they have done for me to chase after my dream. BobcatsHockeyBlog: Tell us the type of person that the Quinnipiac community will get on and off the ice? Logan Britt: I am a hardworking and determined player on the ice. Off the ice I consider myself to be a good kid that likes to crack some jokes and enlighten the mood. BobcatsHockeyBlog: What are some of the things that Logan Britt likes to do when he is not on the ice? Logan Britt: I love to hangout with my teammates and bond together. I enjoy watching movies and I’m a big dog person so I love playing with my dog. I occasionally play Fortnite with the guys and friends back home.